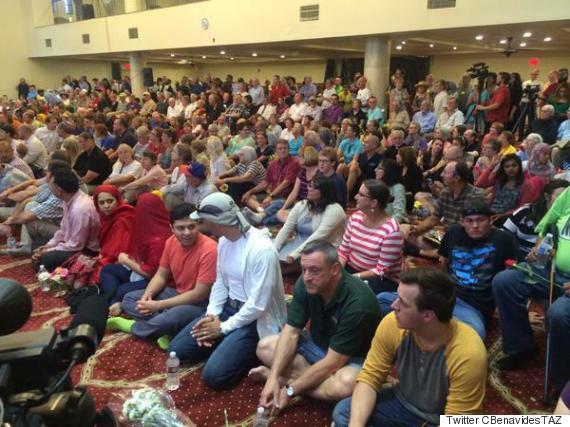 Arizona’s interfaith community is standing with its Muslim brothers and sisters. Religious leaders gathered at the Islamic Community Center of Phoenix on Monday evening for a solidarity vigil against a group of armed bikers trying to spread an anti-Muslim message. The bikers’ “Freedom of Speech Rally Round II” and accompanying “draw Muhammad” contest were organized by Jon Ritzheimer, an ex-Marine. 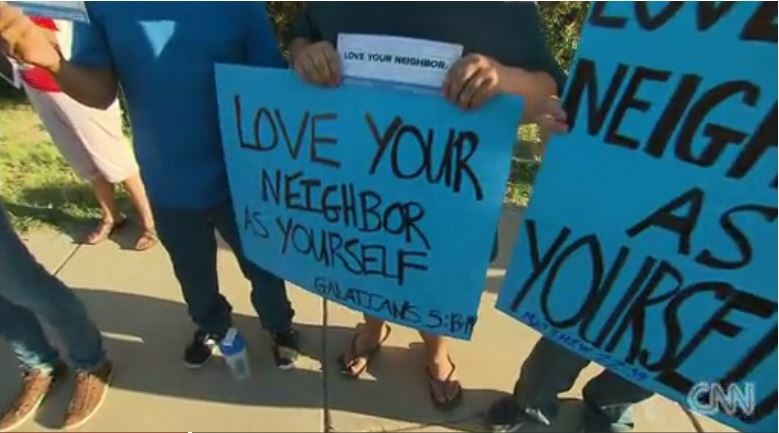 His group may have intended to send a message of hate to the mosque’s 800 members, but churches and synagogues in Phoenix were determined to reject that hate with a powerful show of love. Monday’s vigil was organized by more than 20 groups including the Arizona Interfaith Movement and the Anti-Defamation League and drew about 200 participants, according to Reuters. The event featured a number of speakers and a time for attendees to meet and greet. Community members also left flowers at the mosque, filling the house of worship with “peace, love and care,” Tamayo said, instead of the negative messages the mosque has received in the past. In early November last year I was invited, along with Palestinian Christian Sami Awad and Israeli Danny Sherman to speak to a group of Muslims in Phoenix, Arizona. We, as American and Palestinian Christians and an Israeli Jew, were able to speak with this community about peace-building efforts in the Middle East. It was a blessing to have this time and the people I met there were excited and willing to be a part of these peace-building efforts. When I heard this young Muslim boy’s question: “Why do Christians hate us?” My heart was broken. Hatred toward Muslims is wrong — for all of us — especially for those of us who choose to follow Jesus. When I had the opportunity to respond to this young boy’s question, I said, “Because we don’t know you.” Getting to know people who are outside of our standard circles — particularly those outside of our own faith traditions — is a crucial step to raising awareness and enabling ourselves to build bridges that lead to peace. This is especially true for high-tension and multi-faceted subjects like the conflicts in the Middle East and the growing tension between American Christians and Muslims. 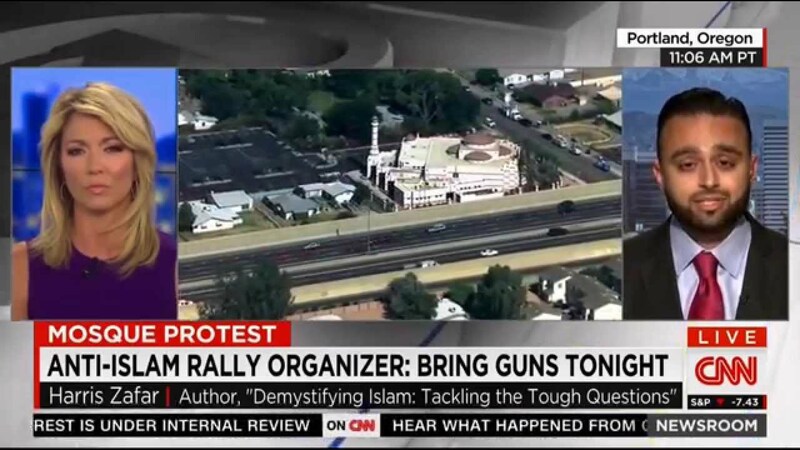 This talk took place at the Islamic Community Center in Phoenix. The same place where people organized an anti-Muslim rally and on May 29 protesters showed up outside wearing shirts with profanity and carrying weapons. I can only imagine what that young boy must have been thinking. I can only wonder if people within that community remembered our words about what it looks like to follow the teachings of Jesus. In the face of such divisive force, how might those Muslims have experienced Christian followers of Jesus? PHOENIX—What was billed as both an anti-Islam and pro-free speech rally in Phoenix turned into a peaceful, but heated, religious debate Friday night. The first evening of the hottest weekend so far this summer kicked off with a group of several hundred motorcyclists rallying outside the Islamic Community Center in central Phoenix. The protest was dubbed the “Freedom of Speech Rally Round 2,” copy-catting a similar event in Texas earlier in May organized by activist Pamela Gellar, who encouraged attendees to draw cartoons of Mohammed in an affront to the Islamic commandment not to make images of their prophet. Two gunmen opened fire outside of that event in Garland, Texas, and were killed by police. They were suspected followers of radical Islam. One had been investigated earlier for reportedly trying to join a militant group in Somalia. Those gunmen were from Phoenix and were believed to have worshipped at the Islamic Community Center. While the tension Friday electrified the crowd, it never erupted into physical violence. Still, attendees were rattled, and loud noises—motorcycles revving or the pounding of several news choppers overhead—seemed to make everyone jump. Countering the motorcyclists was an equally large group of anti-protest-protesters, many of them evangelical Christians from a handful of nearby churches. Adam Estle, executive director for the nonprofit organization Evangelicals for Middle East Understanding, organized the “Love Your Neighbor” rally to stand between the motorcyclists and the mosque. “These are my neighbors,” said Estle, who also lives in Phoenix and attends Orangewood Nazarene Church, next door to the mosque. He said when he heard about the rally, he contacted his friend, Usama Shami, who heads the mosque. Shami asked Estle if he could organize a group of people to show love and support for the Muslim community that worships there.